Washington, D.C. – Energy efficiency has made major strides in the US in the last 35 years, with “energy intensity” – the measurement of energy used per dollar of gross domestic product – down from 12.1 thousand Btus per dollar in 1980 to 6.1 thousand Btus per dollar in 2014, according to a major new report from the nonprofit American Council for an Energy-Efficient Economy (ACEEE). ACEEE found that about 60 percent of the improvement in energy intensity over the report’s 35-year period was due to energy efficiency and about 40 percent to major structural changes in the economy. The bottom line: Just the energy efficiency portion saved US consumers and businesses about $800 billion in 2014, roughly $2,500 per capita. Even though U.S. energy use edged up by 26 percent from 1980 to 2014, the U.S. gross domestic product (GDP) increased by 149 percent. The ACEEE report is available online at http://aceee.org/research-report/e1502. The energy use of new clothes washers has declined by more than 70 percent. The energy use of new homes per square foot has declined by nearly 20 percent. Industrial energy use per unit value of product is down by nearly 40 percent. The fuel economy of passenger vehicles has improved by more than 25 percent. Energy losses in the US electric transmission and distribution system have declined by more than 25 percent. Better systems integration, including through “intelligent efficiency,” i.e., the use of sensors, controls, big data, and computer chips to monitor and control energy use in real time. 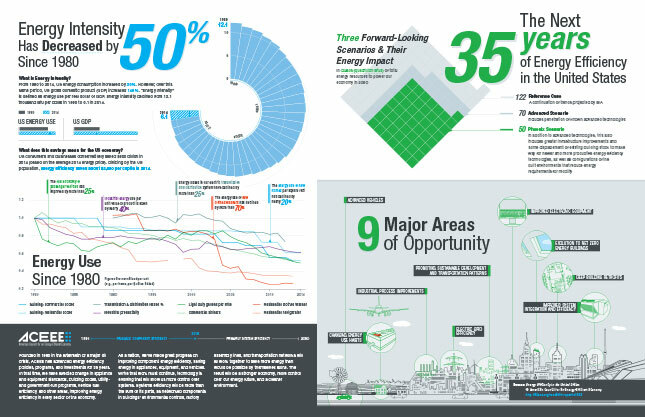 Evolution of building design to yield zero net energy and ultra-low-energy buildings. Better efficiency of the electric grid through expanded use of combined heat and power systems, greater power plant efficiency, reduced transmission and distribution losses, expanded use of other distributed generation resources, and improved grid control and integration.